Did you know? That a migraine can occur in 4 stages? It is also a myth that all migraineurs will experience all the stages. Prodrome, aura, migraine attack and postdrome make up the 4 stages in which a migraineur may experience. 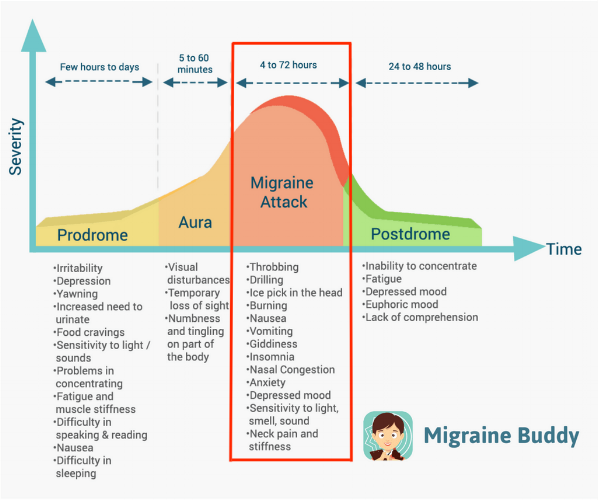 Previously, we have discussed on the first 2 stages (Aura and Prodrome), and today a greater emphasis will be placed on the actual migraine attack. The pain intensity of the headache can often be aggravated by even simple say-to-day activities and other physical activities. Most migraines last approximately 4 hours. If not treated or no response is shown to treatments, it can last up to 72 hours or longer. If one experiences aura, the pain may overlap with the aura. Stay tuned in the upcoming weeks for more insights on migraine triggers! Are any of the above mentioned symptoms ones that you experience too?